Maybe you’ll like this. I did, when I dredged it up from a subterranean file of writing I’d forgotten about. I didn’t forget this girl, though. A.T. was a favourite student of mine, and Number One Babysitter of Son the Fourth when he was “the world’s happiest child”. In a writing class I was taking, not teaching, I was assigned to interview somebody interesting, and I chose a chubby, bespectacled grade 11 with a great brain, lovely brown eyes and a lethal wit. She still writes, but the activist appears to have won out: she’s spent the past half-dozen years doing development work with an NGO in Africa. She’s come a long way from Caledonia. “I always wanted to be Jann Arden”, says A.T., a 16 year old high school student, “but I can’t sing. I guess I’ll be a writer–what else can I do?” A. even looks a little like Arden, and has the same intelligence and self-deprecating wit, although her self-possession suggests she will not have to go through the same depressing chemical adventures in seedy bars. Here’s hoping, anyway. An only child (a gentle iconoclast right from the womb), she nonetheless has loads of family history, blithely speaking and writing about her father’s recent marriage to “the fourth Mrs. J. T.”. I likely should have been more familiar with William Sloane Coffin. (I even missed his death this year, an important passage in American life.) I’m old enough, for one thing, although his greatest public attention came when I was still defining student activism, say, as careening on crutches around Mrs. Whitelaw’s class. As a quote-scavenging young teacher, though, I came to appreciate Coffin jewels like these, even when I was fuzzy about who the author actually was: Even if you win the rat race, you’re still a rat and Every nation makes decisions based on self-interest and then defends them in the name of morality. The dude could write. 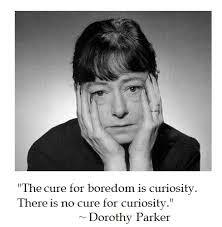 How often do we hear of someone straddling those apparent paradoxes now? (Or ever?) Sacred rage. A thinker with faith. A child of wealth who went on to “tell the rich of the midnight sighing of the poor”, as Bahá’u’lláh once put it. And, perhaps most remarkably, a man of religion for whom the Gospels were a call not to moralize or to maintain a comfortable pew, but rather a call to generosity, compassion and social justice. Lapham quotes from Coffin’s first message as Yale’s chaplain to the incoming freshman class: The Lord forbids our using our education merely to buy our way into middle-class security. WOW. This was in 1959, friends. 1959. 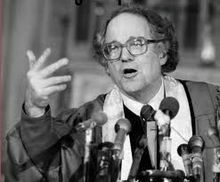 Mr. Lapham — and it’ll be a black-armband day when he leaves us — closes by recommending a little book called Credo, William Sloane Coffin’s collection of the lessons of his life and the meaning of democracy. I’m buying.